BlueView Technologies, Inc. is the leading provider of state-of-the-art compact acoustic underwater measurement and imaging solutions for defense, energy, civil engineering, transportation, and port security applications worldwide. BlueView’s advanced sonar systems have been adopted by leading manufacturers and service providers to support mission critical underwater operations. More than 500 BlueView commercial systems have been successfully deployed on ROVs, AUVs, diver hand-held units, boat mount systems, and tripod platforms. These systems have been delivered to energy groups around the world, over 25 major US port security groups, US and international navies, NOAA, and global defense contractors for a wide range of underwater vision applications. In addition, many AUV systems have been deployed to provide integrated gap-fill, obstacle avoidance, automated homing, and 3D imaging capabilities on most major platforms. BlueView customers enjoy a low cost of ownership with reliable operation, exceptional service, on-site training, extensive online information, and worldwide after-sale support. BlueView Technologies, Inc., is a leader in compact acoustic underwater measurement and imaging solutions. BlueView uses proprietary, breakthrough technology to deliver high performance acoustic capabilities for the first time in compact, low power systems. BlueView has developed a broad line of 2D and 3D commercial systems that operate from 225 kHz to 2.25 MHz to meet a broad range of underwater measurement and imaging needs. Within the last year, and at the direct request from multiple industry segments, BlueView has expanded its line of 2D imaging sonar with multiple field-of-view options, including a breakthrough 130°.. In 2010, BlueView launched a new line of 3D mechanical scanning systems that are a quantum leap forward in underwater 3D visualization and mapping. The new BlueView 3D systems deliver accurate high-resolution data and imagery at levels akin to topographic 3D laser scanners establishing new standards in imaging and mapping underwater structures and areas. The first systems are currently deployed in the energy and civil engineering segments. Since its founding, BlueView has worked closely with the US Navy to develop AUV systems for a variety of specific applications. More than 45 AUV systems have been delivered to provide integrated obstacle avoidance, automated homing, and 3D imaging capabilities on a variety of AUV platforms. Recently, BlueView developed a new, unique 3D MicroBathymetry solution that provides high-resolution imagery for side scan gap-fill and target identification. The new system covers the region directly below the AUV, a gap typically present with side scan systems, increasing area coverage and significantly reducing mission times. Teledyne Odom has more than 25 years’ experience manufacturing high performance sonar systems with a hard earned reputation for durability, precision and customer service. 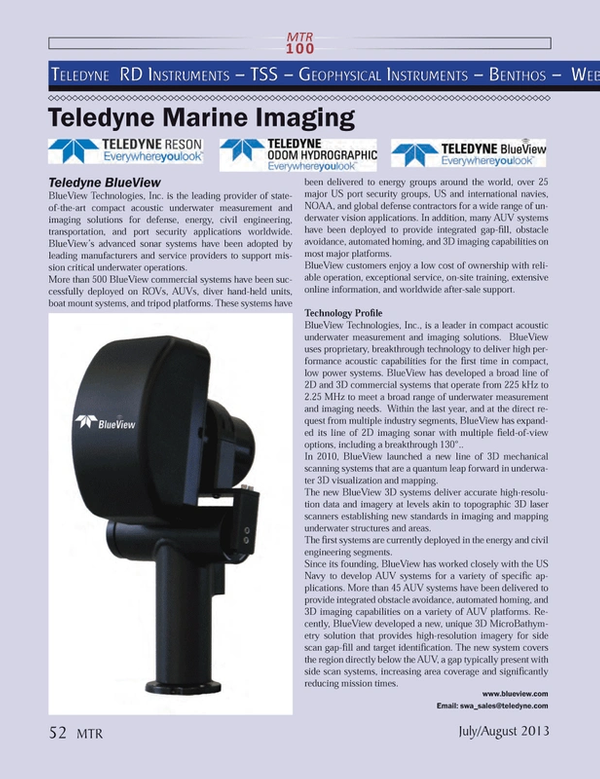 From portable dual frequency single beam echo sounders to fully integrated multibeam systems, Teledyne Odom Hydrographic has equipment to meet the most challenging demands. Teledyne Odom are now pleased to announce the transition of the Teledyne Benthos Geophysical product line over to Odom, which includes their Sub Bottom Profiler and Sidescan Sonar systems. The Teledyne RESON name is the hall mark of class leading sonar equipment, transducers, hydrophones and survey software that you can count on. Headquartered in Denmark, Teledyne RESON has a global presence with offices and representatives around the world. Teledyne RESON flagships are the Seabat Multibeam Echosounders and our Data Acquisition Software PDS2000.